Sydney was a founding member of Watermelon Web Works in 2002. While volunteering for a SE Portland organic vegetable farm, she discovered her true passion. Thus, in 2004 she began traveling and volunteering (WWOOFing) on farms, while continuing to design and market web sites in the evening hours — most notably on Hawaii in a screened-in hut, by candlelight, with the company of a gecko running across the keyboard! By 2006, her curiosity drew her to New Zealand, so she left Watermelon in the motivated, inspired, and capable hands of Paul, put her laptop in storage and became a full-time traveling farmer. 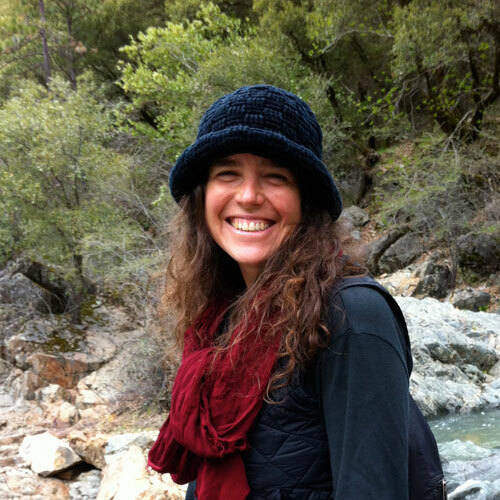 She has since settled in Nevada City, CA, where she grows, gathers and cooks food (including watermelons!) for folks, and from time-to-time enjoys finding new members for the Watermelon Web Works team. You can usually find Sydney: Hiking, swimming or lying on the rocks of the Yuba River canyon.